The 1st contender is Jamjam Malacad Aringo who is taking up Business Management major in Financial Management. She is a former vocal coach and now works as a sales associate. The next contestant is Patricia Mae Dela Torre who is a graduate of Secondary Education major in English. She considers herself as a jack of all trades and owns a gown and barong shop. Last but not the least is Bembem Mamaclay who is a 3rd year student studying Radiologic Technology. Her father who is a retired soldier was once not happy with her gender preference but now accepts her fully. 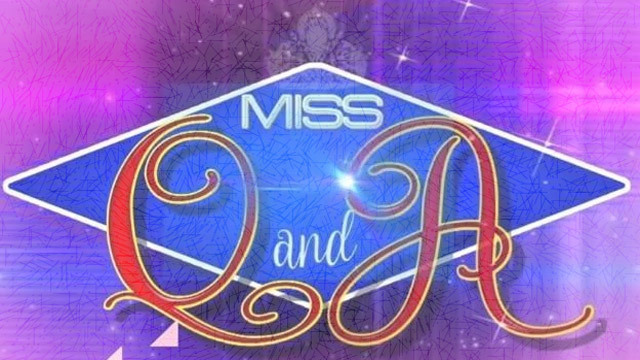 For the 1st question about the song “I Will Always Love You”, contestant no. 2 is the first one to press her buzzer but answered incorrectly. Jamjam took her chance and gave the precise answer to advance in the next round. When the 2nd question was asked about Russia, Patricia finally gave the exact answer and took the final spot while Bembem is eliminated. Jamjam is called and her question says; if birds don’t have hands, why do they suddenly appear? She answered that birds are sometimes cease to be visible because they are going somewhere where they can find food. Patricia is the next one to be called and her question says; if a fortune teller knows how to hula hoop, will she be called hulahooper? She responded that it is possible because every one of us is allowed to learn something new. Based on their answers, the judges chose contestant no. 2 to compete with the reigning queen. Patricia and Benzen are going to answer the question that says; if you will have an amnesia, what is the memory that you don’t want to forget? The daily winner said that it is when her father told her that he is going to support whatever she wants to do and accepts her for who she is. On the other hand, the defending winner stated that she always wants to remember the love of her family because as a working student, she sometimes feels that she has an amnesia. After a deliberation, Benzen is now a semifinalist and will defend her crown tomorrow.